If you need to escape the post Christmas and New Year blues I would highly recommend the Twelfth Night celebrations on Bankside outside Shakespeare’s Globe starting at 2pm on Sunday 6th January 2019. Twelfth Night is an annual seasonal celebration held in the Bankside area of London. It is a celebration of the New Year, mixing ancient seasonal customs with contemporary festivity. It is free, accessible to all and happens whatever the weather. To herald the celebration, the extraordinary Holly Man the Winter guise of the Green Man (and an honorary member of The Company of the Green Man) decked in fantastic green garb and evergreen foliage is piped over the River Thames, with the devil Beelzebub. With the crowd by Shakespeare’s Globe, led by the Bankside Mummers and the London Beadle, the Holly Man will ‘bring in the green’ and toast or ‘wassail’ the people, the River Thames and the Globe (an old tradition encouraging good growth). Mummers will then process to the Bankside Jetty, and perform the traditional ‘freestyle’ St. George Folk Combat Play, featuring the Turkey Sniper, Clever Legs, the Old ‘Oss and many others, dressed in spectacular costumes. The play is full of wild verse and boisterous action, a time-honoured part of the season recorded since the Crusades. Cakes distributed at the end of the play have a bean and a pea hidden in two of them. Those from the crowd who find them are hailed King and Queen for the day and crowned with ceremony. They then lead the people through the streets to the historic George Inn Southwark, for a fine warming-up with the Fowlers Troop, Storytelling, the Kissing Wishing Tree, Dancing and Mulled Wine. I would like to wish all of our members and blog readers a very Happy New Year and a Healthy and Happy 2017. If you need to escape the post Christmas and New Year blues I would highly recommend the Twelfth Night celebrations on Bankside outside Shakespeare’s Globe starting at 1:45pm on Sunday 8th January 2016. I would like to wish all of our members and blog readers a very Happy New Year and a Healthy and Happy 2016! 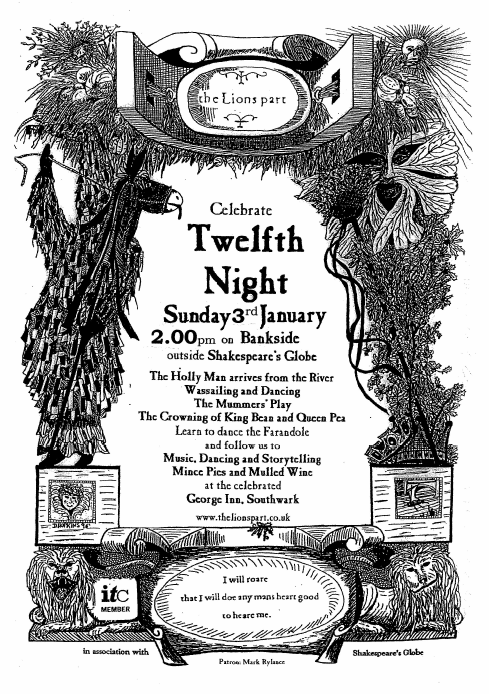 If you need to escape the post Christmas and New Year blues I would highly recommend the Twelfth Night celebrations on Bankside outside Shakespeare’s Globe starting at 2:00pm on Sunday 3rd January 2016. To herald the celebration, the extraordinary Holly Man the Winter guise of the Green Man (and an honorary member of The Company of the Green Man) decked in fantastic green garb and evergreen foliage, appears from the River Thames brought by the Thames Cutter, Trinity Tide (boat subject to weather!) rowed by hardy volunteers. With the crowd, led by the Bankside Mummers, the Holly Man ‘brings in the green’ and ‘wassails’ or toasts the people, the River Thames and the Globe – an old tradition encouraging good growth. The Mummers then process to the Bankside Jetty, and perform the traditional ‘freestyle’ Folk Combat Play of St. George, featuring St George, Beelzebub, the Turkey Sniper, the Doctor, Clever Legs, the Old ‘Oss and many others, dressed in their spectacular and colourful ‘guizes’. The play is full of wild verse and boisterous action, a time-honoured part of the season recorded from the Crusades. At the end of the play, cakes are distributed – a bean and a pea hidden in two of them. Those who find them are hailed King and Queen for the day and crowned with ceremony. The 2014 TWELFTH NIGHT Celebrations will be held from 2.30pm on Sunday 5th January 2014. To herald the celebration, the extraordinary Holly Man (the Winter guise of the Green Man from pagan myths and folklore) decked in fantastic green garb and evergreen foliage, appears from the River Thames brought by the Thames Cutter, Trinity Tide (boat subject to weather!) rowed by hardy volunteers. The Mummers then process to the Bankside Jetty, and perform the traditional ‘freestyle’ Folk Combat Play of St. George, featuring the St George, Beelzebub, the Turkey Sniper, the Doctor, Clever Legs, the Old ‘Oss and many others, dressed in their spectacularand colourful ‘guizes’. The play is full of wild verse and boisterous action, a time-honoured part of the season recorded from the Crusades. They then lead the people in procession through the streets to the historic George Inn in Borough High Street for a fine warming up with Storytelling, the Kissing Wishing Tree and more Dancing. The 2013 TWELFTH NIGHT Celebrations will be held from 2.45pm on Sunday 6th January 2013. 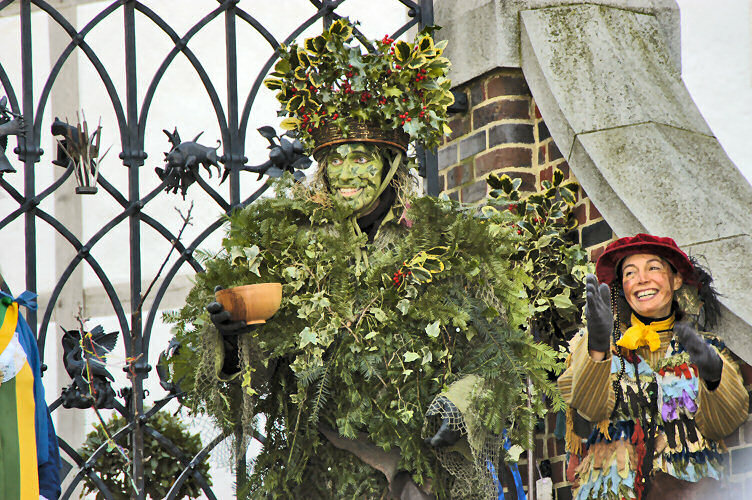 To herald the celebration, the extraordinary Holly Man (the Winter guise of the Green Man from pagan myths and folklore) decked in fantastic green garb and evergreen foliage, appears from the River Thames brought by the Thames Cutter, Master Shipbroker (boat subject to weather!) rowed by hardy volunteers. The Greenman (In his autumnal guise of The Berry Man) will be walking out with the Lions part at their October Plenty festival on Sunday the 24th Octobe from 12 noon on the Bankside outside Shakespeare’s Globe. October Plenty is an Autumn harvest celebration held annually in Southwark. Beginning on the Bankside, by Shakespeare’s Globe, October Plenty mixes ancient seasonal customs and theatre with contemporary festivity, joining with historic Borough Market, Southwark. October Plenty is a collective celebration of the seasons, weather and food, in a public place, with access to everyone. The event is free, and happens whatever the weather. A huge Corn Queene effigy heavy with ‘Plenty’ – wheat, barley and other grains, and apples, root vegetables and foliage from the Borough Market – appears in a procession around the front of the Globe, Bankside, with the Company of actors and the time-honoured Hobby Horse in attendance, strung with cakes and loaves and led by the Berry Man. The Berry Man – our Autumn incarnation of the original Green Man – decked with wild fruits and foliage, leads the company. He carries an Apple Tree to where it will be placed within the Bankside area, with general songs and music on the street for all. After gathering a sizeable crowd, we then move through the streets to the Borough Market. There in the Green Market there is time to savour the delights on offer: soul cakes, apple biscuits, conker fights, cider from the New Forest, apple bobbing, a great beer selection and the wonderful market stalls as well as more dancing. The play performed changes from year to year; we like them to be short-ish and funny-ish. Last year the Company will perform two of Chaucer’s Canterbury Tales. The Nun’s Priest’s story of Chanticleer and Partelote and that which the Reeve tells are amongst the best known and best loved of Chaucer’s stories. Newly adapted for October Plenty and spiced with festive spirit and song, these plays are performed in Southwark where Chaucer’s pilgrims first gathered – you’ll be laughing and gasping over your cider! We create a little glade of young English apple trees as a space for children to gather. There they can decorate and re-clothe the trees with green wishes (paper apples) and listen to stories about apples, markets, harvest time, bees and London sparrows! There is a tasting table of old apple types from London by Brogdale Horticultural Trust with decorations created at Roots and Shoots, the Lambeth community gardens environment project where the Corn Queene is created.